Quality footwear for the biggest occasions. When the spotlight is headed your way, make sure you’re dressed to impress from head to foot. 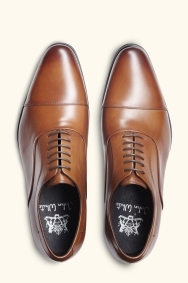 These tan Oxfords from leading English shoemaker John White are just the ticket if you require some sleek footwear to complete your outfit. Made from leather uppers and soles, they feature a cushioned lining for added comfort. 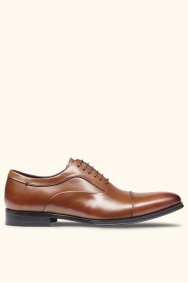 Pair these expertly crafted Oxfords with a blue or navy suit and matching tan belt for the sharpest of appearances. The suit was lovely, we had to order a shirt to be picked up a few days later, when we picked the shirt up there were two lines on either side of where the tie would lay 'over stiching I think ' the second gentleman we saw did over to order another but we needed it the next day so couldn't wait, we did get money off though. Again the gentleman looked around the shop for another as there had been a delivery. Lovely pair of shoes. Really good quality and go perfectly with my suit. 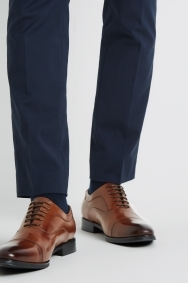 Son loved these shoes and they go well with his suit. More expensive than I would normally spend on his college shoes, but they appear good quality and very smart. He says they are also very comfortable. 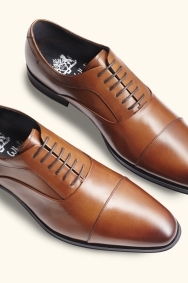 Quality leather shoes, reasonably priced. Look good and comfortable too. Great shoes, love them !!! Very good, comfortable, stylish, but slightly expensive, but quality is something you pay for. Great shoes, thanks very much.